The result? Amoretti Brothers cookware, individually crafted by master coppersmiths from shiny copper and decorated by hand with a hammered pattern. 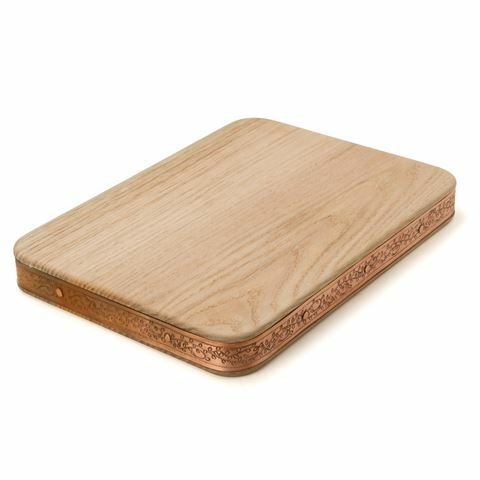 This exquisite solid oak Chopping Board is the perfect companion to such cookware, banded in copper that has been pressed with a delicate ivy pattern. This frame, riveted in to place, coordinates spectacularly with Amoretti Brothers’ cookware…but it will look beautiful even if you don’t have a piece of this prestigious cookware in your home. Made from solid oak wood, with a pressed copper band. Dimensions: 40cm (l) x 29cm (w) x 4cm (h).